Robert Fulton is generally remembered as the inventor of the steamboat. 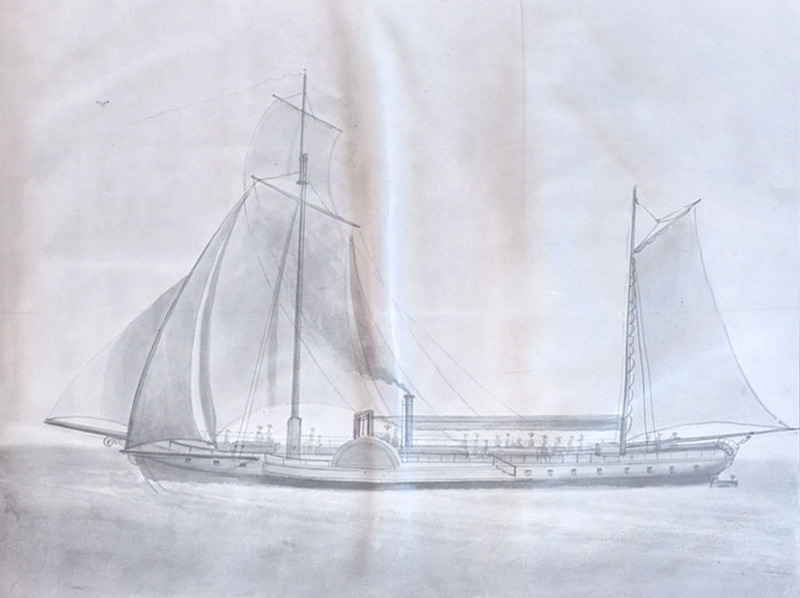 There is some controversy over his debts to previous inventors, but Fulton was the one able to develop a steamboat which was commercially successful, and which led to the rise of steamboat transit. I hadn’t thought about it much, but his patent in his steamboat is one of the key documents in the history of American invention and technology. That changed a bit ago when Adam Mossoff tweeted this out about how the patents Robert Fulton took out in his famous steamboat were lost, and I couldn’t just leave it be. Perhaps nothing gets my attention more than saying that something is “lost,” so I had to look into it. It turns out that the patents are less lost than has commonly been assumed. As Adam mentioned, in 1836 a fire at the Patent Office destroyed essentially all the patent records. An effort was made at the time to rebuild the files of the Patent Office from 1836 and before, and that reconstruction included a numbering scheme that led these to be called the “X Patents” to distinguish them from patents issued after the fire. Although there has been some work to reconstruct them from extant sources, Adam is correct that the Fulton patents are generally presumed lost. However, a bit of looking revealed that a copy of the original patent does indeed exist, and I’ll include scans below, although the quality is sometimes less than ideal. In the midst of the great depression, an heir, presumably of Robert Fulton, offered to sell the New York Public Library the patent documents and some related materials for $3,000 (roughly $50,000 today). The Library declined, but did make photostats of the documents. The New York Public Library still has these photostats, and I was able to photograph them, and then did some basic processing (converting the negative photostats to positive documents, for instance). The photostats are held today (unsurprisingly) as part of the the Robert Fulton collection, in the Manuscripts and Archives Division of the New York Public Library. These aren’t of reproduction quality, but they allow us to see the patent and what it claimed fairly clearly. The original documents are still at large, and at the end of this post I’ve included some leads on where they might be. Drawing taken from the patent file. The documents I found include the patents not just of Robert Fulton, but of John Stevens as well. Stevens and Fulton had competing patents/steamboats, and Fulton’s exclusive license for New York was a major bone of legal contention, until the U.S. Supreme Court found that license to violate the commerce clause of the Constitution in the 1824 decision in Gibbons v. Ogden. Note that some of the patent documents are a bit blurry, but the latter documents which include technical details and drawings are fairly clear and focused. Letters Patent to John Stevens for the construction of steam engines and boilers, and a new mode of working floats and paddles for propelling boats, dated January 3, 1810. Signed by President James Madison and attested by secretary of State R. Smith, and Attorney General C. A. Rodney. With the Schedule of John Stevens. Letters Patent to Robert Fulton for Improvement in Steam Boats, dated February 11, 1809. Signed by President Jefferson, and attested by Secretary of State James Madison, and Attorney General C. A. Rodney. With Fulton’s Schedule. Letters Patent to Robert Fulton for “Inventions and Discoveries for constructing Boats or Vessels, which are to be navigated by the Power of Steam Engines,” dated February 9, 1811, Signed by President James Madison, and attested by Secretary of State R. Smith and Attorney General C. A. Rodney. With Fulton’s Schedule. Printed form, filled in, certification “That the annexed are true Copies of the Specification Drawings & reference to Drawings of Inventions and Discoveries, for constructing Boats or Vessels which are to be Navigated by the power of Steam engines for which Robert Fulton Esqr. obtained a patent the 9th Day of February 1811,” by Robert Smith, Secretary of state. (2 copies); followed by 4 pp. folio of the description of the Steam Boat, signed by Fulton, and witnessed by John R. and Matthew Livingston. Followed by 18 pp. folio of further detailed description, signed by Fulton and witnessed by the same two Livingstons. Followed by wash drawings, colored, the first a “View of the steam boat passing the highlands,” the others dated 1808, numbered 1 to 13, being detailed scale drawings of the boat and machinery. Printed form~ filled in, certification “That the annexed are true Copies of the petition Specification Oath and References in the Office of the Secretary of State of Improvements in the Construction of Steam Engines and boilers, and a new mode of working Floats or paddles, for propelling boats for which a patent has been granted to John Stevens of the City and State of New York the 3d day of January 1810,” signed by Robert Smith, Secretary of State, August ‘8, 1811. Followed by the petition of John Stevens, dated “New Y0rk December 26. 1809” to the Secretary of State, followed by the Specifications of Stevens etc. sworn the 26th of December 1809 before Minch. Keppele, Alderman. Followed by “Description in words, of inventions to move boats or vessels by the power Steam Engines,” by Robert Fulton (2 pp. ), witnessed by John Nich0lson and George Lyon. Followed by 7 pp., folio, of Robert Fulton, on his invention and discoveries for constructing boats or vessels to be navigated bf the power of steam engines, deposed October 2, 1810, with Fulton s patent receipt for thirty dollars from the Treasurer of the United states, dated January 29, 1811. Followed by wash drawings numbered 1 to 8, and dated November 20 1810 of details the macihinery, etc., and of Which drawing 6 is confined to a fullpage view of his paddle-wheel steamboat. As indicated, in May of 1934, Mrs. Leta Forsyth Thomson, 131 West 76th Street, care of Carrie S. Hasbrouck, New York City, offered to sell this document for three thousand dollars. The address is no longer good of course (the internet shows a number of sales in the past two decades, let alone before), but it’s all the information I have. I did some brief genealogical searching on these individuals and largely came up empty – I’d be curious if someone else can do better. Presumably they still have the originals.